And with that, I'll leave it. Thanks for your company this afternoon. It's been an afternoon of twists and turns in the Premier League - and at the end of it, Jose Mourinho sits on top of the table. A familiar feeling for him. Will it last? Stay tuned for the next nine months. For now, though, it's goodbye. Very, very early days, but here's how the embryonic Premier League table stands. It won't stay that way for the season, though, surely? Well, funny you should ask. The leaders on the opening Sunday of last season? Leicester City. It has been a strange weekend in the Premier League, with last season's top two - Leicester and Arsenal - both losing their opening game. My BBC colleague Chris Bevan has been chasing down the stats gurus at Opta this afternoon to find out the last time that happened. Impressively, they have come up with the answer. It was in 1953 - and again, Arsenal were involved. The Gunners, then champions, lost 2-0 at West Brom, while runners-up Preston were beaten 2-1 by Huddersfield. In short, what we've seen this weekend doesn't happen very often. In today's two EFL matches, meanwhile, QPR when top of the Championship by winning 2-0 at Cardiff, while in League One, Bristol Rovers defeated Oxford 2-1. Here's a little more of Wenger, speaking to Sky Sports: "We played a very good first half and were unlucky to concede a goal just before half-time because the free-kick was very harsh. "After that we paid for a lack of experience. I have said many times we are working very hard to get one or two players in. I don't know what you call desperate. They [any signings Arsenal make before the transfer window closes] need to make sense and be of quality." Arsenal boss Arsene Wenger, speaking to BBC Match of the Day: "We lacked experience at the back and we were physically short. Liverpool did well and we were for 15 minutes completely shocked. We pushed players today like Aaron Ramsey. It is an impossible situation to get players back from the Euros and prepare." Interesting breakdown in the match stats from Opta. As you can see, Arsenal have marginally more of the possession, yet Liverpool had far more efforts at goal - 16 to the home side's nine. An indication of how well Jurgen Klopp's team counter-attacked in the second half, perhaps. Arsene Wenger has just given a rather terse response to Sky Sports reporter Geoff Shreeves, who asked the Arsenal manager if he felt under pressure after opening the season with a defeat. "I am always under pressure," said Wenger. More from Klopp: "Nothing is sure until the final whistle. Over the whole of the 90 minutes it was a deserved win. "We can always score goals and we can defend much better. It's the Premier League and nothing should be easy in this league. Nothing is easy." "I played a big part in the excitement of the last half-hour, because it’s not allowed to celebrate the fourth goal like this with 35 minutes to go," Liverpool manager Jurgen Klopp says. "At this moment, we switched off the machines. The game was not over. Arsenal lost, but we gave them a path back into the game." Mowbray concludes by asking Klopp if he plans to get an elastic band for his glasses, to stop them flying off when he celebrates. The Liverpool manager proves he is a good sport in responding to the question. "If somebody wants to watch me lose my glasses, they can," he says. "I will try to improve on this." Match of the Day's Guy Mowbray begins his interview with Liverpool manager Jurgen Klopp by asking: "Is that how you expected it to go?" Klopp laughs loudly. "Exactly," he replies. 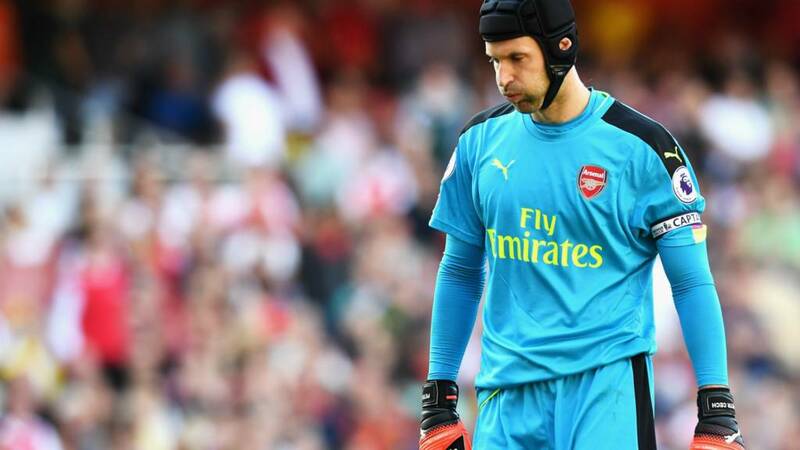 More from Arsenal goalkeeper Petr Cech, who looks understandably miffed after being beaten four times: "When you are 4-1 down in the opening game it's sometimes hard to find guts to react but we scored two goals. At 4-1 it is difficult to come back. "You don't want to lose games. As a player we understand the supporters came with the ambition to win the first game of the season. You have to take the result on the chin. We played well for 60 minutes. We were not good enough for 30 minutes." Amir Jiwa-Walji: If we don't sign a new left back, we won't get top 4 this year! Arsenal goalkeeper Petr Cech, speaking to Sky Sports: "We had a great start to the game. We were organised and controlled the game. It was disappointing to miss the penalty but the reaction of the team was great because we broke through. "In the second half, the momentum changed because of the free-kick. Liverpool came out with more ambition and were very aggressive. We were punished by the Lallana goal and once we fell behind we opened the game too quickly and allowed them three, four, five counter-attacks." Now we've got a little bit of time to reflect, let's take a look at arguably the goal of the game - Philippe Coutinho's second, which put Liverpool 3-1 up. The boffins at Opta tell us that there were no fewer than 19 passes in the build-up. Liverpool playmaker Philippe Coutinho - who scored twice - has spoken to Sky Sports: "It was a good, tough game. We are happy because we won. The first 20 minutes, we didn’t play very well like the manager wanted. "We played a difficult game and played really well. We’ll focus on the next game, and take it step by step." More from Lallana: "Maybe we showed them too much respect in the first half. We came out of the traps flying in the second half and got the second, third and fourth. It was a bit of a tense last 10 minutes on the bench. "We’ve got huge belief. We’ve got top players on the bench. We’ve got a great squad. We’re not in Europe so we’ll have a lot of weeks where we only have to play one game." Some quick post-match reaction - Liverpool midfielder Adam Lallana has been speaking to Sky Sports: "It was a very entertaining game.We didn't start so brightly after a good pre-season but it's always difficult coming to Arsenal. "The manager had a few words for us at half-tim and we responded brilliantly. We got a bit complacent at 4-1, but Arsenal are a top team. We want to achieve something special this year we have to be more disciplined as a unit."